This month, he published a summary of the technique he believes will allow doctors to transplant a head onto a new body (Surgical Neurology International, doi.org/2c7). It involves cooling the recipient’s head and the donor body to extend the time their cells can survive without oxygen. The tissue around the neck is dissected and the major blood vessels are linked using tiny tubes, before the spinal cords of each person are cut. Cleanly severing the cords is key, says Canavero. Next, the muscles and blood supply would be sutured and the recipient kept in a coma for three or four weeks to prevent movement. Implanted electrodes would provide regular electrical stimulation to the spinal cord, because research suggests this can strengthen new nerve connections. Canavero isn’t alone in his quest to investigate head transplants. 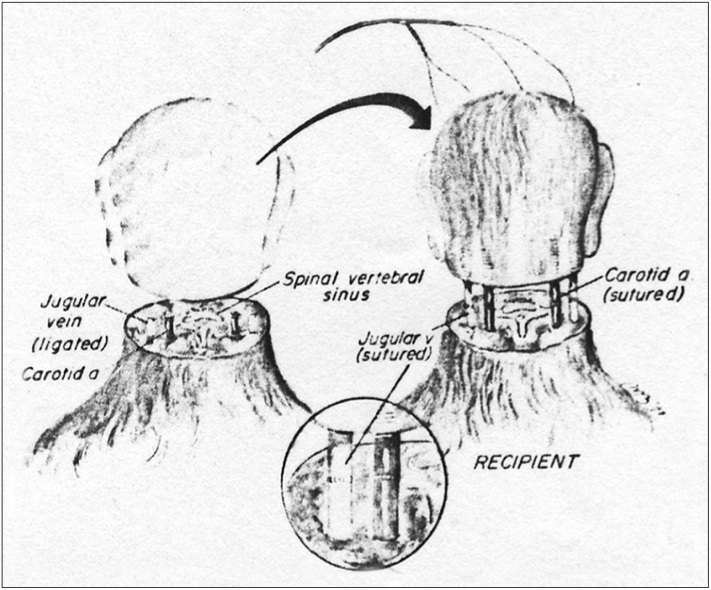 Xiao-Ping Ren of Harbin Medical University in China recently showed that it is possible to perform a basic head transplant in a mouse (CNS Neuroscience & Therapeutics, doi.org/2d5). Ren will attempt to replicate Canavero’s protocol in the next few months in mice, and monkeys. Perhaps they should try something a little less ambitious and start with a penile transplant.